Having spent some time recently picking teams of players with varying themes someone suggested to me an XI of those Test players who were taken from us too soon. It seemed like an interesting idea so this is the result. I chose 40 as the arbitrary age so there was no place for two of my favourite fast bowlers, Malcolm Marshall and Sylvester Clarke, who died at 41 and 45 respectively. Choosing the cut-off there does mean there are a couple of all time greats here, the legendary Victor Trumper and, Yorkshire’s finest, Hedley Verity. Archie Jackson was clearly destined for greatness and, perhaps surprisingly in view of the passage of time, his reputation seems to enure down the years. In view of that I find it a little odd that another unfulfilled Australian, Ross Gregory, is seldom remembered today. Of the XI only Anglo-Australian Ben Hollioake, victim of a car crash in 2002, and New Zealand’s Ken Wadsworth, who died of cancer in 1976, post date the Second World War. As many as five of the team were lost in conflict (Maurice Turnbull, Colin Blythe, Tibby Cotter, Gregory and Verity). Only Hollioake was lost on the road and of the five who succumbed to illness Fred Grace would have undoubtedly survived today, and the causes of the deaths of Trumper, Jackson and Amar Singh are rarely fatal now. More than a century has passed since the photograph was first taken, but George Beldam’s iconic image of Victor Trumper jumping out to drive remains, for many, the greatest cricketing photograph ever taken. History places Trumper on a pedestal high above the rest of his contemporaries. There is, in some ways, an inevitability that those who die young will have their reputations enhanced by the wave of grief that accompanies their passing, but in Trumper’s case it has to be said that almost without exception his peers placed him on that high plateau before, as well as after, his tragic death. What made Victor Trumper the batsman that he was was the combination of style, grace and power that is so wonderfully depicted in Beldam’s photograph. When Trumper was at his best all bowlers on all types of wickets came easily to him and that is no more vividly illustrated than by his performance on the 1902 tour of England when he scored 2570 runs at an average approaching 50. Amongst the Australians who helped retain the Ashes in that distant summer no one, on the tour as a whole, got within 900 of Trumper’s tally of runs, and his average was 50% better than the next man. In what was generally a poor summer for batting no Englishman exceeded his total of runs, and only one, Nottinghamshire’s Arthur Shrewsbury, who scored less than half of his total, managed to average fractionally more than the great Australian. Trumper’s most successful test series against England was, in a losing cause, in 1903/04 when he averaged more than 63 and scored nearly 600 runs. He exceeded even that in 1910/11 against South Africa a series which produced 661 runs for him at an average of more than 94. Trumper’s overall average for his 48 Tests is fractionally under 40, and therefore by today?s standards not the sign of a batsman of the highest class, but batting was not so easy in Victor Trumper’s time and, ultimately to the benefit of the paying public, he was not a man interested in playing defensively. There can no doubt, from reading contemporary accounts, that he did on occasions lose his wicket early due to trying too much too soon. It is also clear that on occasions his appetite for runs was sated by reaching his century, and that he did not bat on in circumstances where a batsman with a different outlook would have done so. That Trumper played for as long as he did is a credit to his ability to deal with the adversity caused by his poor health and the kidney disease that eventually caused his death in 1915 at the age of 37 – at least the game saw the best of Victor Trumper, who is an automatic selection for this team. A year younger than Sir Donald Bradman there were some who saw both play who felt that, had tuberculosis not claimed Jackson at the tragically early age of 23, his achievements over his career might have matched those of “The Don”. Certainly he seems to have given much greater pleasure to the connoisseur, his elegant style of batting being said to be reminiscent of Trumper. Jackson was just 19 when he was first selected for a Test match and given the unenviable task of opening the batting in the fourth Test against Percy Chapman’s 1928/29 England tourists, who had swept all before them and were already 3-0 up in the series. England posted a first innings total of 334 before Jackson went out to open the batting with Woodfull. An English attack including Harold Larwood and Maurice Tate reduced the Australians to 19 for 3 before Jackson was joined by his captain, Jack Ryder, and they saw the Australians through to the close at 131 with Jackson 70 not out. Even then his health was less than perfect and while the emotional energy expended must have made a contribution contemporary reports of how exhausted he was strongly suggest that he was less than fully fit. The following day Jackson carried on and took his debut century to 164 before he was sixth out. In the second innings he contributed another 36 to an opening partnership of 65 with Woodfull and Australia, chasing 349 to win, ended up tantalisingly short by just 12 runs. The Australians finally did succeed in a consolation victory in the final Test Jackson scoring 30 before being unfortunately run out in the first innings, and 46 in the second. Despite concerns over his health Jackson was taken to England in 1930 where he played in two of the Tests. His fitness problems meant that he only showed glimpses of his true form however, in the final Test at The Oval, which Australian won by an innings in order to regain the Ashes with a 2-1 victory, he scored 73 of a partnership of 243 with Bradman which was to have significant repercussions. Despite the apparent comfort with which the Australians won that Oval Test it was then that the theory was born that Bradman was vulnerable to fast short pitched bowling. Larwood had, for the first time all summer, worked up to something approaching his full pace and he noticed that after a break for rain, when the pitch had livened up considerably, Bradman seemed perturbed and anxious to avoid his thunderbolts. Jackson on the other hand, as Larwood was quick to point out, stood up to everything that was thrown at him even when it involved taking blows on the body. Jackson’s last four Test matches were against the West Indies in 1930/31, a series in which he scored 70 not out in the first Test, but thereafter his form fell away and he was eventually left out for the final Test. At that stage it was not, of course, known that his career was over but in eight Test matches he had averaged 47 and at least the game had seen glimpses of what he was capable of. By the time Douglas Jardine’s touring party arrived in 1932/33 Jackson was gravely ill, although despite his chronic shortness of breath he continued to play grade cricket right up until the beginning of February 1933. On 10 February the fourth Test of the Bodyline Series began in Brisbane, just a few miles from the hospital where Jackson lay. On the fourth day of the match he summoned sufficient strength to send a congratulatory telegram to Harold Larwood in relation to his “magnificent bowling”. Two days later he was dead. The telegram was to remain Larwood’s most prized piece of memorabilia for the rest of his long life. The names of Jackson and Trumper fit easily together as the first two batsmen on this team sheet. Maurice Turnbull was Glamorgan’s first Test cricketer and their first high quality batsman. Whether at the crease, or later as captain, Turnbull always set out to entertain and his dashing play earned him a place in the distinctly understrength MCC party that toured New Zealand in 1929/30 where, in the final Test of the four match series he made his debut. The following winter Turnbull toured South Africa with a stronger party and played in all five Tests. Three more appearances in a full strength England side, two against West Indies and one against India, followed in the home series in 1933 and 1936. At Test level Turnbull’s record in those nine Tests was wholly unremarkable – he only once recorded a half century. His disappointing Test record counts against him, although his First Class record, playing for one of the weaker counties, is pretty good, Ultimately it is his reputation as an excellent Captain that gets Turnbull into this eleven. A fine all round sportsman, Turnbull also won two caps for Wales at Rugby Union and playing hockey for his country. He was inspirational on the sports field, and also in action, and his was one of the highest profile losses suffered by British sport in the Second World War when, as an Officer in the Welsh Guards, he was killed in action in Normandy in 1944 at the age of 38. Fred Grace was the fifth and youngest of the famous brotherhood, and in his early career the expectation of a number of knowledgeable observers was that he was likely to go on to be the best of them. He was an attractive, attacking batsman who on occasions looked unstoppable, however he lacked the concentration and grim determination that helped turn older brother WG into the immortal he became. Many hoped that in time Fred might have acquired the necessary resolve, but he certainly had not done so by the time of his tragically early death at 29. Altogether for Gloucestershire Fred scored just over 2,000 runs at an average of 28, which was comfortably better than eldest brother EM’s career average, albeit someway short of WG’s. He also took, with fast round arm bowling, more than 160 wickets at less than 20 apiece, again a better record than EM’s and, in county matches at least, better than WG’s. There was just one Test match for England for Fred Grace, in 1880. He was selected alongside his older brothers at The Oval. Sadly he was dismissed in both innings without scoring, although he is remembered for taking a steepling catch to dismiss George Bonnor – legend has it that the batsmen had just turned for their third run as Fred completed the catch, having run a considerable distance to get underneath the ball. Fred was not assisted in that Oval match by a heavy cold and it had not been shaken off a few days later when, whilst playing at Stroud, he was soaked during a heavy downpour. He did at that stage take to his bed briefly to try and recover, but insisted on fulfilling a commitment to play in a benefit match at Winchester and travelled on to Hampshire as planned. Following his arrival his health quickly deteriorated and he died of pneumonia less than three weeks after stepping out at The Oval for his Test debut. Ross Gregory (who was not related to the famous family that, before his time, produced Dave, Syd, Ned and Jack) was just 26 when he was killed in action in 1942. The RAAF Wellington bomber of which he was a crew member crashed over what is now Bangladesh. He was the only Australian Test cricketer to die in the Second World War. Gregory was a precocious young batting talent. He scored 128 for Victoria against Gubby Allen’s England tourists in November 1936 and, with Australia 2-1 down, he was called into the Test side for the last two Tests. An attractive strokemaker he scored 23 and 50 (run out) in the fourth Test, and followed that up with 80, on the day before his 21st birthday, in the final Test. Australia won both matches to become the first Test side to win a series after being 2-0 down. Gregory had a disappointing home season in 1937/38, averaging less than 30, but it was still a surprise when he was left out of the party that toured England in 1938. Due to the war there were to be only those two caps for Gregory but, had he had the opportunity, it seems reasonable to assume he would have acquired the consistency he lacked – without the intervention of the Grim Reaper Gregory might well have been, at 32, one of the 1948 “Invincibles”. He may not have the longest of pedigrees but I have read enough to know that Ross Gregory deserves a place in this team. It is a sobering thought that, had it not been for the road accident that cost Ben Hollioake his life in 2002 at the age of 24, it may have been him and not Andrew Strauss leading England to their historic victory in this winter’s Ashes. His international debut had come against Australia in the false dawn of 1997 when, for a few weeks, it seemed that the Australian stranglehold on the Ashes was over. In May Ben came in for the third and final ODI which England won to record a clean sweep. In that game his brother Adam, as he had in the first two matches, scored the winning runs, but it was 19 year old Ben who caught the eye. He came in at first drop with England chasing an imposing total. His 63, scored from just 46 deliveries and taken off an attack including Glenn McGrath and Shane Warne, paved the way for victory and all England had hopes that another Ian Botham had been unearthed. Later that summer, after a big innings victory in the first Test had continued the illusion for a while, the Australian juggernaut got back on track and by the fifth Test England called up Ben and Adam to make their debuts. Ben scored a few runs, and took a couple of wickets, but looked out of his depth. He was not retained and indeed was to play just one more Test, against Sri Lanka, a year later. That is not to say he disappeared from the selector’s thoughts, he had played an ODI just a few weeks before his death, but the sort of consistency in the First Class game that the selectors wanted to see was still work in progress at the time of his death. The important fact that remains is that Ben Hollioake was a hugely talented and exciting cricketer. His temperament was right for high pressure games, and he had an easy charm and an engaging personality. England do not pick young cricketers very often, and only Brian Close has made a debut at a younger age, so the reality is that when he died he had his whole career in front of him. I believe he would have become a great player, and the thought of him playing for England throughout the last decade, and the partnership he might have forged with Andrew Flintoff, is a tantalising one. Ken Wadsworth was 21 when he made his First Class debut. He was a batsman who could keep wicket and played as such. He was fortunate in that his batting showed up well in his early matches and the selectors gave him a chance to tour England, Pakistan and India as reserve wicketkeeper in 1969. After the tourists arrived in England immediate concerns arose about the quality of their batting for the Tests and Wadsworth, his sense of timing immaculate again, took the opportunity to score some useful runs in the early tour matches. The first choice wicket keeper, Barry Milburn, was streets ahead of Wadsworth as a gloveman but his batting was unremarkable and the selectors decided to select Wadsworth for the Tests. A factor in their decision would have been Wadsworth’s personality. He brought a flamboyance and determination to the side which visibly raised morale, and in the years to come he was as responsible as anyone for bringing the professionalism to New Zealand cricket that finally enabled them to compete consistently with the best at Test level. In the early days of his Test career Wadsworth’s wicketkeeping seemed to weigh heavily on his batting and, after as many as 11 Tests, his batting average was no more than seven. By the time the New Zealanders got to the Caribbean for their 1971/72 series there must have been some doubt as to whether he would in fact take his place in the Test side for a series which the cricket world unanimously expected New Zealand to lose heavily. In the event New Zealand cricket came of age that season. The five Tests all failed to produce a definite result, and the visitors exhibited a degree of talent and determination that no one had imagined they had. It might, however, have been very different had it not been for Wadsworth’s contribution to the first Test. The West Indians declared their first innings closed on 508 and the New Zealand top order subsided to 108 for 5 before Wadsworth, with that batting average of seven, came out to join Glen Turner. The 220 that they put on for the sixth wicket (Wadsworth’s share was 78) meant the follow on was avoided. The West Indians went back in and scored a rapid 218 to set the visitors an improbable 341 for victory. They never went for the runs, but at 135 for 5 it seemed that their first innings heroics would be in vain until Wadsworth joined his captain, Mark Burgess, and together with him, and subsequently Bob Cunis, kept the West Indian bowlers at bay and earned a draw. The New Zealanders did not look in any danger of defeat again until the final Test but, just as defeat loomed then Wadsworth, in company with all rounder Bruce Taylor, played out the last two hours and thirty minutes to save the series. From then until the tragically early end to his life Ken Wadsworth’s place in the New Zealand Test side was never in doubt. His wicket keeping gradually improved to such an extent that his name was mentioned as one of the best in the world, and while his batting never quite fulfilled its early promise, and his average never rose above 21, there were other memorable days not least an innings of 80 at Melbourne in the first ever Test match that New Zealand played in Australia in 1973. The cancer that took Ken Wadsworth’s life, at the age of only 29 in August 1976, was remarkably invasive. Only five months previously he had been playing First Class cricket and, in his final innings, recorded his second and higher First Class century, 117 for Canterbury in their innings victory in the final of that season’s Shell Trophy. He is an easy selection as wicketkeeper for this side. In Amar Singh’s day India had only just acquired Test status. They played few matches and enjoyed little success. Despite this Amar Singh was recognised by all who came up against him as a cricketer of the highest class, and in a different age he would doubtless have ended his career with impressive figures. A tall man with a superb athletic physique he was a fast bowler whose long arms and high action generated sideways movement and, his most talked of quality, an ability to gain pace off the pitch. Sir Neville Cardus wrote of him “He swung the new ball now inwards, now outwards. His pace from the ground was vivid. A short run, a sudden rush of energy, loose wheeling arm and the ball flashed down the wicket like a javelin”. As a batsman Singh was always aggressive and hit the ball extremely hard. He was a fine slip fielder as well and one of the most popular cricketers of his day. He came to England in 1932 for India’s first ever Test tour. There was only one Test match on the tour, which England won, comfortably in the end, but the Indians by no means disgraced themselves and Singh dismissed Hammond, Ames and Sutcliffe in the match and also recorded what was to prove his only test half century. The 1936 tour of England marked the end of the Test cricket that Amar Singh would play so he must always be looked on as an unfulfilled talent. The Second World War might well, in any event, have brought down the curtain on his Test career, but it is still one of cricket’s great tragedies that he died from Typhoid in 1940, aged only 29, and that cricket missed what might have been his best years. He did enough in what time he had to show that he should lead this team’s bowling attack. In less than a decade of First Class cricket Hedley Verity took almost 2,000 wickets at the remarkable cost of less than 15 runs apiece. At Test level he was more expensive, his wickets costing more than 24, but given the batsman friendly conditions that he generally encountered those were excellent figures too. Even the legendary Bradman said of Verity “With Hedley I am never sure – there is no breaking point with him”. They played against each other 17 times in Tests. Bradman scored 401 runs from Verity’s bowling, but lost his wicket to him 8 times – so barely half of the 99.94 – in truth it was Verity, much more so than Eric Hollies and his 1948 googly, who denied “The Don” a three figure career average. Perhaps the greatest left arm orthodox spinner of them all Verity had all the skills – he varied his pace, flight, length and spin at will and in helpful conditions could be literally unplayable. For Yorkshire in 1932 he achieved the remarkable figures of 10-10 against Notts. There were some weak sides in the County Championship in those days, but Notts weren’t one of them – they finished the season in fourth place and only three seasons previously had been champions. Had he played for a weaker county Verity might well have become a genuine all rounder. He didn’t need to for Yorkshire but was still a stubborn batsman who averaged 20 in Tests and who on one occasion opened the innings for England in a crisis. 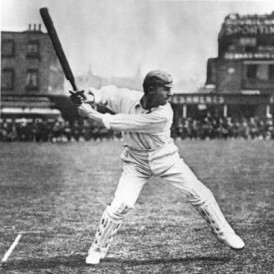 He was said to bat like “Herbert Sutcliffe, a little out of form” which, given the 60+ career average of Sutcliffe, and the use of the adjective “little”, is high praise. Verity was the game’s greatest loss in World War 2. A Captain in the Green Howards he was shot in the chest while leading an assault on a German position in Sicily and captured. He died of his wounds a few days later. He was 38. The most difficult decision I had to make was whether Albert “Tibby” Cotter or Englishman Kenneth Farnes should open the bowling with Amar Singh. In the end I went for the Australian, but their records are so similar it could just as easily have been Farnes. There is a contrast though. Farnes was tall and willowy. He was said to be very quick, but also capable of moving the ball both ways. Cotter, on the other hand, was a short man, built rather like Harold Larwood, and was as fast as they come. There are said to be more than 20 recorded instances of a Cotter delivery breaking either a stump or a bail. By all accounts he was much like Jeff Thomson in the way he bowled, so he must have been a thrilling sight at full tilt. The balance is tipped in his favour on the basis of a few relatively unimpressive newsreel clips that I have seen of the Essex amateur. Cotter made his Test debut in 1903/04 helping Australia to win the final Test of the series with an 8 wicket haul – it was however just a consolation, Warner’s side having gone in to the match leading 3-1. Cotter played his final Tests in a losing cause as well, in 1911/12. He was one of the “Big Six” of Australian cricket who refused terms for the 1912 Triangular Tournament. Had he travelled to England for that it is likely he would have picked up some cheap wickets to boost his career figures. In 1917, not yet 34, Cotter was a trooper with the Australian Light Horse. He raised his head over the rim of a trench near Beersheba in Turkey in order to confirm what his periscope had told him – tragically he was shot by a sniper. Sergeant Colin Blythe died, with countless others, at the Battle of Passchendaele on 8 November 1917. He was 38 years of age and had taken more than 2500 first class wickets at less than 17 runs each. He was a classical orthodox left arm spinner and in 1909 was described as being “better than any other bowler on a good wicket, and much better than any other bowler on a bad wicket” yet when, in 2000, Wisden came to publish its “Five Cricketers of the Century”, Blythe did not receive a single vote. There were 28 bowlers nominated for the accolade and of those only Sydney Barnes had a better Test career average and strike rate. It is remarkable how quickly cricket history has forgotten about a man who once took 17 for 48 in a day. Blythe’s Test record is excellent but does not on its face show just how dominant he was in English conditions as his record in Tests overseas is significantly inferior to his record in England. That said even in England he was not always treated sympathetically by successive selection committees. By way of example in 1909 Blyth was at the peak of his powers. There was an Ashes series that summer that England lost after a promising start. In the first Test at Edgbaston Blythe took 11 for 102 as England won comfortably by 10 wickets. He missed the second Test at Lords on medical advice and, it seems, was simply not considered for the third Test although the problems he had had at Lords, which appear to have been more mental than physical, were resolved. Blythe returned for the drawn fourth Test but by now England were behind after two Australian victories – even so had rain not interfered Blythe’s 7 for 140 might have enabled England to win and draw level in the series. Moving on to the Oval England never looked like winning the drawn fifth Test for which Blythe was, again, simply not selected. Two tests in South Africa in 1909/10 were the last of Blythe’s career. Altogether he played in 19 Tests, taking exactly one hundred wickets at 18 runs apiece. That record confirms Blythe’s excellence – it is considerably better than the likes of Wilfred Rhodes, Hedley Verity and Tony Lock managed, all of whom enjoy loftier reputations than Blythe. It is about time cricket history reassessed the importance of this brave man who, had he returned after the Great War, could perhaps have challenged even Wilfred Rhodes’ record career haul of wickets. For Blythe to have returned would have been a simple matter as he had skills which could have given him a reserved occupation, and health issues which, had he so chosen, would have enabled him to avoid the draft. It is a testament to his courage that he ignored those available exemptions and volunteered. He and Verity are the best available spinners for this team by a distance so despite their similarity of style they are both selected. Excellent work, as ever tho. I can absolutely see why one would not wish to include him, but were the claims of WJ Cronje ever considered? Johnny Briggs and Billy Bates both say “Hi”, btw. Absolute tragedy what happened to him but he was not a very good cricketer. Great article.Though i’m wondering if this team was made up randomly,or is it a best ever team of players who died before 40? If it’s the latter,then Cronje definitley deserves to be here.Matchfixer or not,he was one of the finest modern day captains. I would throw in a personal mention for Wilf Slack who died aged 34. He was a slightly above average County pro who was perhaps a tad fortunate to play for England, but a really likeable chap who died far too young.